Now it is easy to book classified ads in Prabhat Khabar Newspaper through Online booking process. You just need to follow few simple steps process to get your ad published in Prabhat Khabar Newspaper. There are various options available to advertise in Prabhat Khabar. The major one are Classified Text Ad, Classified Display Ads and Display Ads. You need to understand the difference between this three before choosing the option. Once you understand and choose the right option and complete the ad booking. Go to Prabhat Khabar Ad Booking Page. Check out editions list with Ad Rates mentioned for Prabhat Khabar Newspaper. You can select individual edition or available package for Prabhat Khabar Newspaper. Select desired date from the Calendar to publish your ad in Prabhat Khabar. You can also choose Special offers if you wish to advertise for multiple days. Finally, Review your ad booking for Prabhat Khabar Newspaper and register yourself then pay online through Debit Cards, Credit Cards or Net Banking. After you successfully make payment you would receive a booking confirmation email from us. Post editorial review your ad would get published in Prabhat Khabar Newspaper. Prabhat Khabar, a Hindi Daily Newspaper is published by Neutral publishing company Ltd. and was established in 1984 in Ranchi, the capital of Jharkhand with 6-8 pages and a run of around 500 copies everyday. 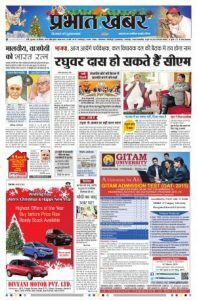 Prabhat Khabar has since then expanded its reach and now the newspaper is been circulated with 10 editions in Jharkhand, Bihar and West Bengal. Prabhat Khabar is printed and circulated from Ranchi, Jamshedpur, Dhanbad, Deoghar, Patna, Muzaffarpur, Bhagalpur, Gaya, Kolkata & Siliguri. nowadays it’s 7th among top ten Hindi Dailies in India, with a readership of at least9 million and 8 editions published across East India. Patna – (190,957 copies), Ranchi – (159,310 copies), Muzaffarpur – (94,285 copies), Bhagalpur – (91,311 copies), Jamshedpur – (84,384 copies), Kolkata – (64,982 copies), Dhanbad – (60,176 copies), Gaya – (50,416 copies), Deoghar – (37,726 copies).